Note: This piece is the Essential travel article in Paste Quarterly #1, which you can purchase here, along with its accompanying vinyl Paste sampler. From the ledge atop the day’s final pass, a grassy, amphitheater-shaped clearing, encircled by mountains, appeared beneath us. The Albanian Alps rippled behind, marking our path from the last several days along the 1,200-mile Via Dinarica mega-hiking trail, which traverses all eight countries in the western half of the Balkan Peninsula. To the north, peaks towered above and lined the border with Montenegro. Directly ahead and to the east, a jagged collection of summits faded into Kosovo. On the valley floor below—the size of several city blocks—multiple flocks of sheep occupied quadrants of the expanse and moved with a balletic unison perfected over centuries in this corner of Southeastern Europe. They drifted like fluffy schools of fish or lethargic marching bands. Instead of music, however, the sound echoing up to our ridge was a cacophony of bleating and the clanging of atonal bells. Hyperactive herding dogs ran circles around the animals and nipped at band members breaking formation. In the distance, and on the apron of the plateau, we could make out the nomadic shepherd village of Doberdol, our destination for the evening. The cluster of impromptu lean-tos, temporary shelters, and thatched-roof huts built of stacked flagstone was abuzz with families bringing in horses and filling jugs with stream water. Smoke curled from chimney pipes as villagers began feeding wood into iron stoves in preparation for dinner. villages. It can be walked for three months, three days, or three hours, depending on the stretch of land an adventurer has time to cover. As importantly, the trail unfurls like a variegated quilt, the squares stitched together across epochs and empires with the heritages, gastronomies, music and traditions of the South Slavs, Albanians, Greeks, Illyrians, Romans, Byzantines, Ottomans, Venetians and Austro-Hungarians all on display. Our expedition team descended into the pasture. 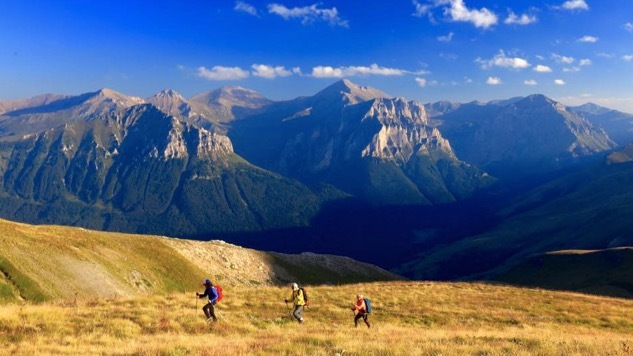 It was impossible not to feel overwhelmed by the majesty of the landscape—even for mountaineers who make a living hiking throughout the Via Dinarica region. Just as powerful though, was the palpable sense that we were part of a Balkans-wide, philosophical sea change in adventure tourism. He turned to leave, calling out directions to villagers in every direction. His brother came over with a recycled plastic bottle filled with rakija, homemade schnapps made of herbs. Another man ambled over and offered cigarettes and thick, hot Turkish coffee. Another was sent into the field to retrieve a sheep for our dinner. Behind us a woman got to work consolidating two families into one shanty so we would have a hut to sleep in and spread out gear to dry. She shooed chickens out of the dirt-floor dwelling, lit the stove, and motioned us over. When the sun disappeared behind the peaks, we sat on wooden benches around a table crowded with our dinner: grilled meat, young cheese, beans, and more rakija. We wiped our plates clean with dense, farm-made squares of bread. Maps were soon spread out across the rough-sawn surface. Zagreb, Croatia-based Alex Crevar is the editor of Paste’s travel, science, and health sections.